Are you seeing large swaths of webs in your trees and shrubs? It’s that time of year again when certain pests come out in force. One of those summer pests is the fall webworm. But it’s summer, you say…so why are there fall webworms in my trees? Fall webworms can actually have up to four generations a year; starting in spring and continuing through fall. But it’s the fall infestation that usually does the most damage to your trees and shrubs, which is why we call them fall webworms. If you’ve seen large clusters of webs in your trees, they you probably have webworms. Some of their favorite trees include oak, pecan, mulberry and hickory. While there are several species of fall webworms, the one we most often find here in North Texas is Hyphantria cunea. These hairy caterpillars grow to about one-inch long and are either pale yellow or green with reddish colored heads. They have a mottled stripe along their back and are covered with long white “hairs”. Eventually, they’ll become lovely white moths with dark spots on the wings and soft, fuzzy bodies. Webs can spread up to 4-feet, covering huge swaths of your tree’s branches and foliage. 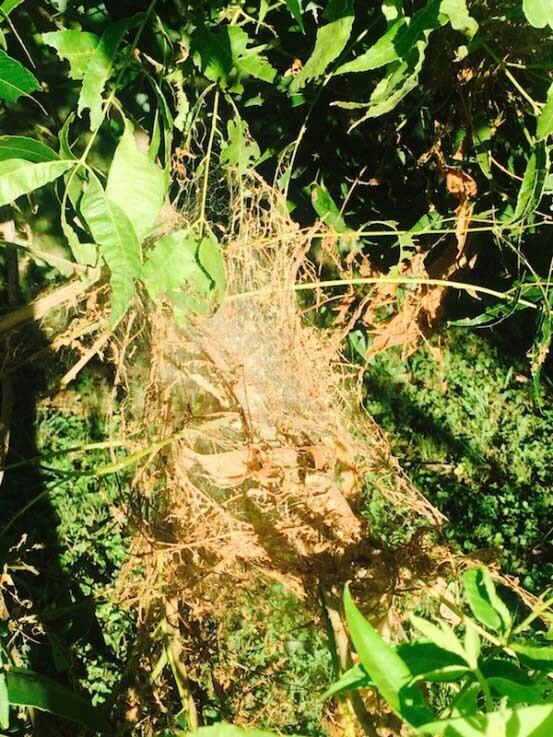 When these chewing caterpillars’ webs cover large enough surface areas of your tree’s canopy, destroying large amounts of foliage, your tree can suffer. Not to mention, the webs and dead leaves are pretty unattractive. Weak or stressed trees are more susceptible to heat stress, water stress and more pests and diseases. To keep trees at their healthiest, we recommend keeping them free of webworms, or a least treating them as soon as they show up in you trees. Natural controls such as Bt, Bacillus thuringiensis, or trichogramma wasps can be very effective at controlling webworms. If the webs are low enough, using a spray hose to knock out the webs and caterpillars can also be a very simple and natural way to treat them. If you’ve had fall webworms in your trees before, chances are they’ll be back. Keep in mind that repeated defoliation can, over time, do permanent damage to your trees. If you are already a Soil Building customer, give us a call if you are notice infestations of fall webworms now through fall.